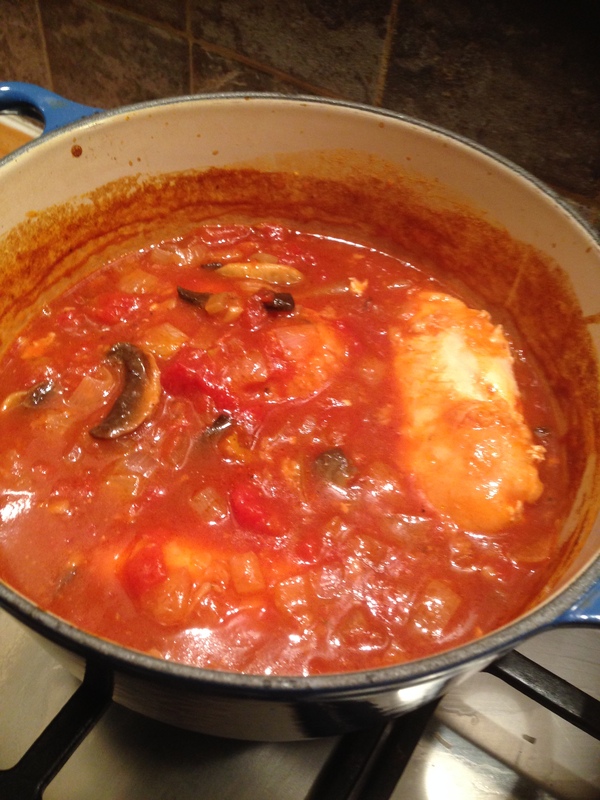 I have a recipe for a quick chicken Chasseur that I’ve made several times over the years and has been a family favourite, so will be interesting to see how this compares..
Before I started this recipe I had to make the espagnole sauce, which I’ve never heard of and doesn’t feature in my usual Chasseur! 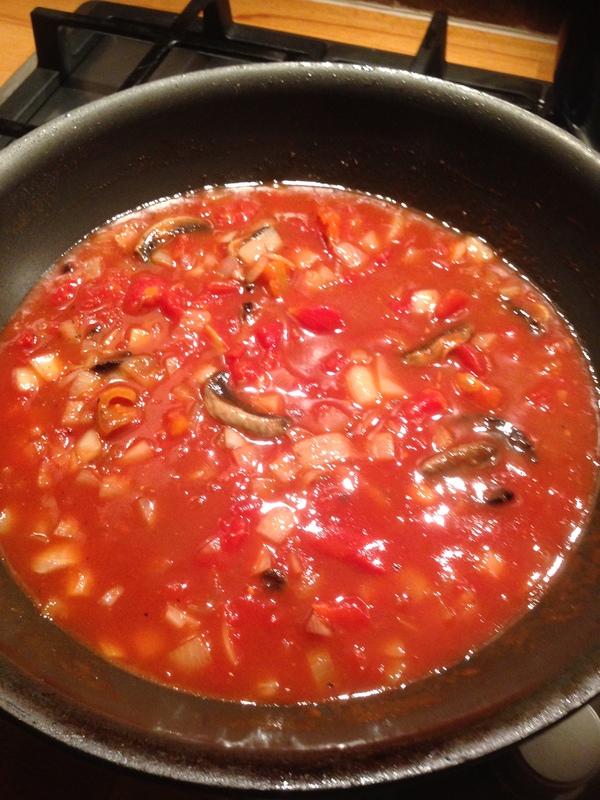 This sauce does take a bit of time to make but it was really worth the effort! It’s a delicious sauce! The only slightly annoying thing about it is the volume you end up with. I had made it with quarter of a pint of stock thinking I’d end up with a quarter of a pint at the end but only ended up with about 100ml, so I just topped up with water. 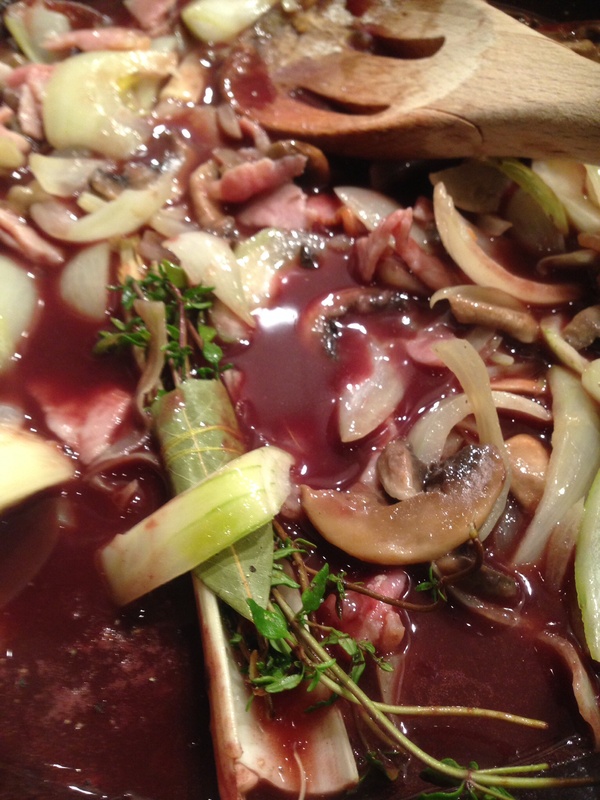 As a sauce on its own it is good..
…and I’ll definitely make that again! To start the Chasseur I fried the floured chicken joints, I was using breasts, in the butter and oil..
Once golden they were transferred to a casserole dish..
Then I fried the onions and mushrooms in the pan..
Then I added the espagnole sauce, tomatoes (had to end up using a tin), wine and seasoning.. 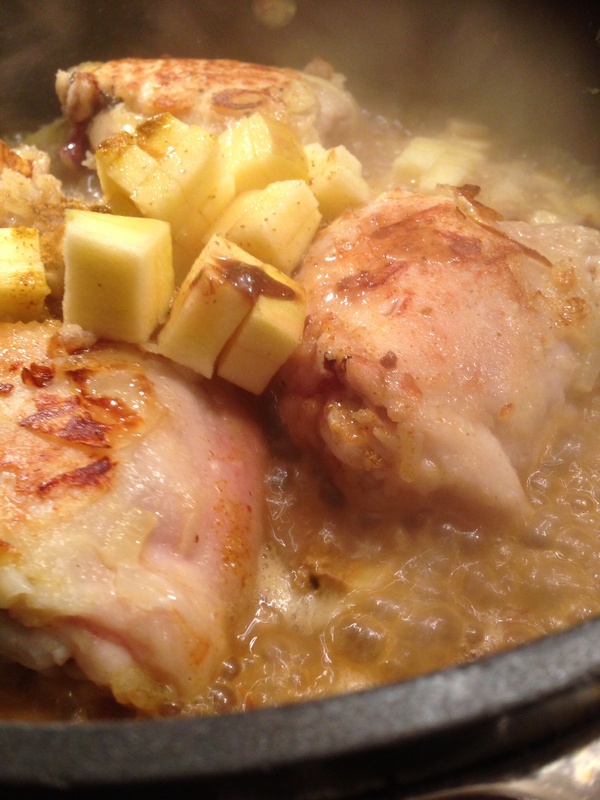 This was poured over the chicken and then put into the oven for about 40-45 minutes.. I think I have a bit more sauce than I would’ve if I had used fresh tomatoes, and perhaps I shouldn’t have put the whole can of tomatoes in! I served this with rice..
I’m glad I made too much sauce as it is pretty good and we all had to go back to the pot and pour on extra sauce! 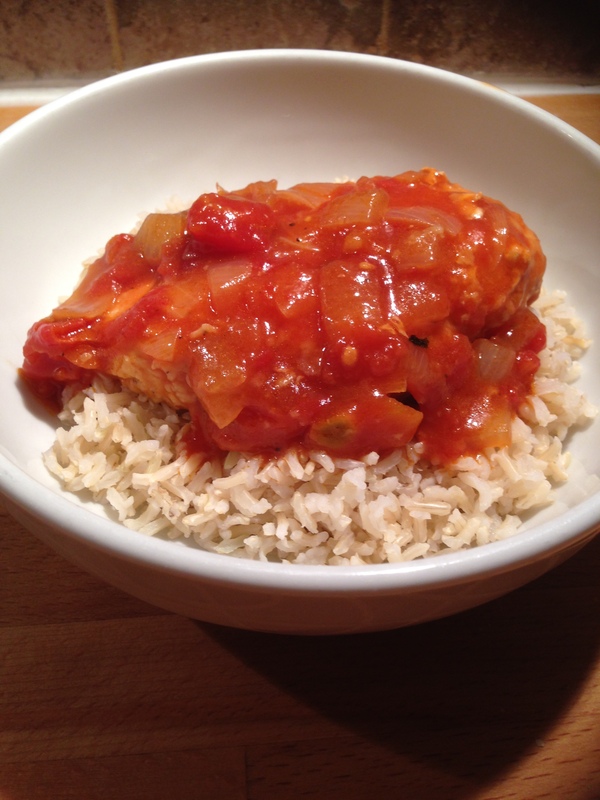 It’s really packed with flavour and the chicken is lovely and soft after being cooked in the sauce. How does this compare to my usual Chasseur? It’s just as good I’d say, and I know there’s bacon in the sauce but I do like actual bits of bacon in my regular Chasseur so would add them to this next time. So I don’t actually have any baskets so I should really just call this recipe Poussins!! Yet again I only bought the one poussin, when I think the idea is to have one per person! They are pretty small but am planning on having this with a few sides.. 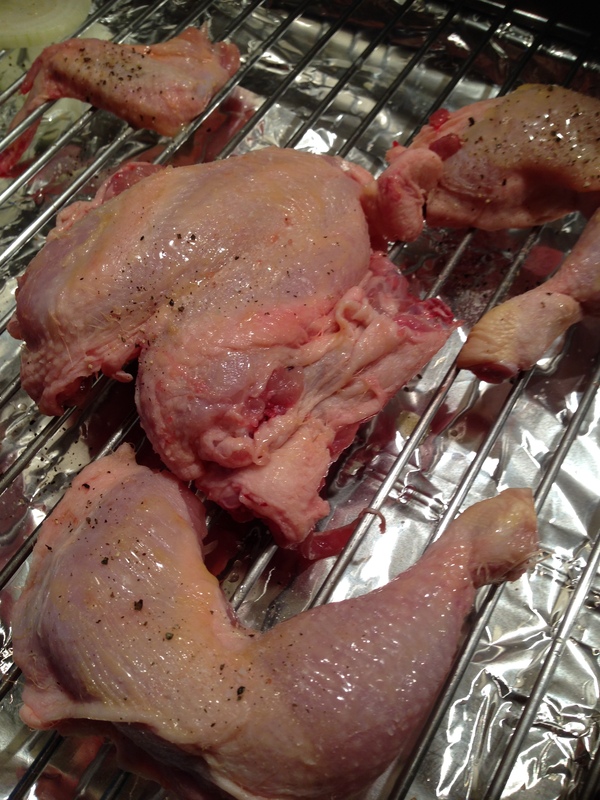 The recipe says to split it down the back and them trim off the legs and wings, but does it mean trim off and throw away or trim off and cook separately? Considering this was for the three of us I removed them and planned to cook them as well.. I think I managed to joint this quite successfully! 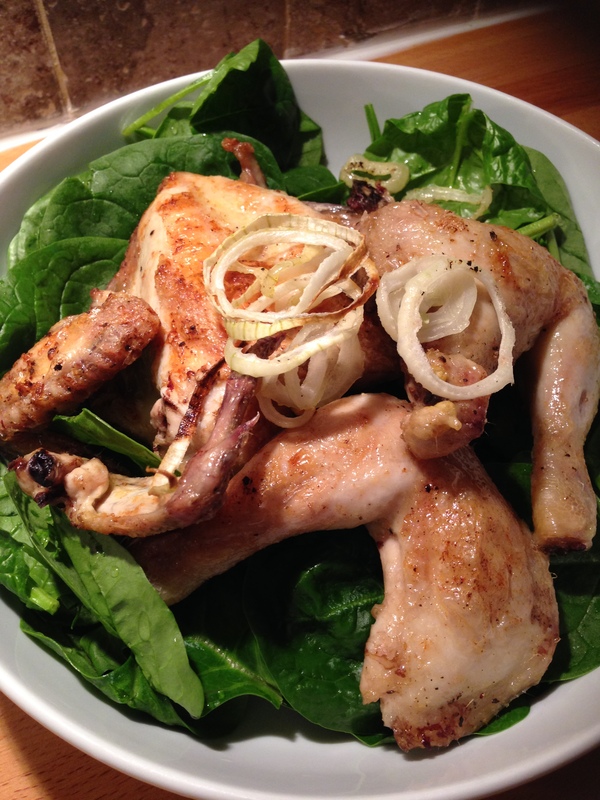 So I brushed the poussin with some melted butter..
Then it was grilled for about 20 minutes or so, and I turned and brushed with more butter a few times..
Not only do I not have a basket but I also didn’t buy watercress and had to make do with spinach instead. I did opt to garnish with the onion but what I did was brush the onion rings with butter and grill them too! 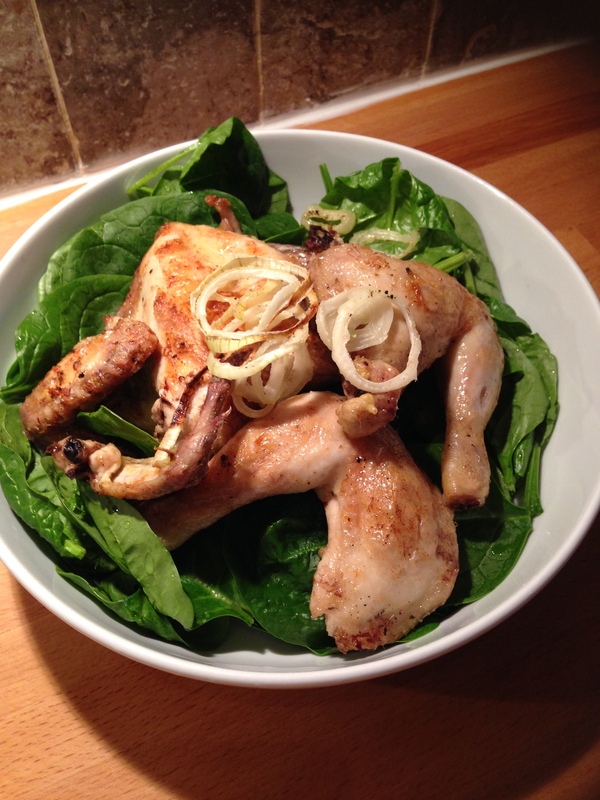 So this poussin in a basket has turned into poussin in a plate with spinach.. This is a nice simple recipe and not really much can go wrong, but not surprisingly there just isn’t enough! The meat is lovely and soft and do think that I should eat the skin because it’s been grilled with all that butter and am sure it tastes good but I just don’t fancy it! I’ve had to take a break from cooking and pretty much most things while I was recovering from a rather painful ankle injury! Now I’m a bit more mobile I’m back in the kitchen! I had hoped to restart my blog with a bit more of an exciting recipe but hadn’t been as organised as usual when doing the food shopping! 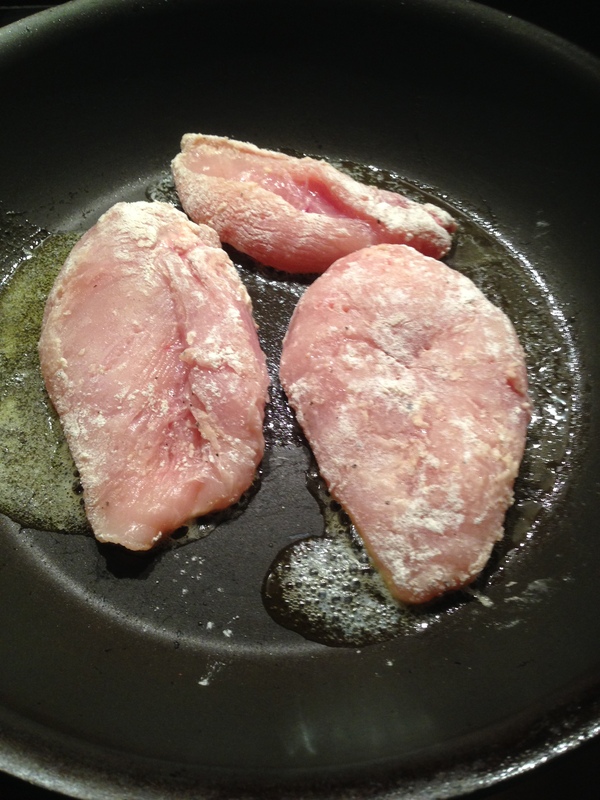 So chicken kievs for tea tonight it is! First off I realised the parsley in my garden had vanished!! I think it was removed accidentally!! So I decided thyme would work just as well and that I have loads of!! So maybe am veering off the classic Kiev route using the thyme but I think the fact that there is no garlic in it anyway doesn’t make it a proper chicken Kiev! They did feature a lot in our house as kids and I did love them, especially the garlic butter. Every other recipe I found for this did have garlic in the butter as well which makes me think this isn’t going to bring back the fond memories of a chicken Kiev! Anyway this is just butter and herbs.. I used some cling film to wrap the butter into a sausage shape and left to chill..
Then I flattened out the chicken breasts and topped each with half the butter.. The next deviation was intentional! It says to tie up with cotton before coating in egg and breadcrumbs, which I think seemed wrong! I know it does say later on to remove the cotton once cooked but I thought that would be a faff, so I decided to omit the cotton and keep my fingers crossed that they keep their shape! I dipped each one in egg and then breadcrumbs.. Mine are maybe not very parcel shaped but I didn’t want to over handle in case they fell apart! I then decided on another deviation and opted to bake them instead. 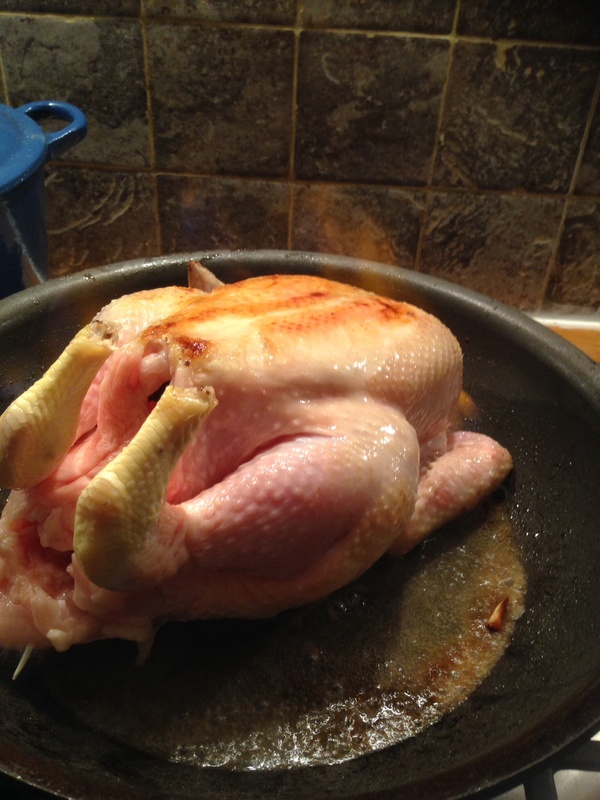 The idea of deep frying a whole chicken breast didn’t appeal to me, and I didn’t have enough oil anyway! So I put these in a hot oven for about 30 minutes. After then the breadcrumbs looked crispy and there had been minimal butter leakage.. I am thinking I was a bit stingy with the breadcrumbs but I was worried about over handling the chicken in case it fell apart.. So I guess the real test is what happens when I cut into it! As expected the herby butter all comes oozing out! The chicken looks nicely cooked and smells good..
Well the chicken is good, it’s lovely and moist which I think is due to the butter inside it, and even though it doesn’t look like a lot of breadcrumbs I think on eating it’s actually just right. The butter did all pretty much pour out but we used that like a bit of a sauce and is great, and I’ve heard that butter is actually good for you!! I do love thyme so actually quite glad I was forced to use that. 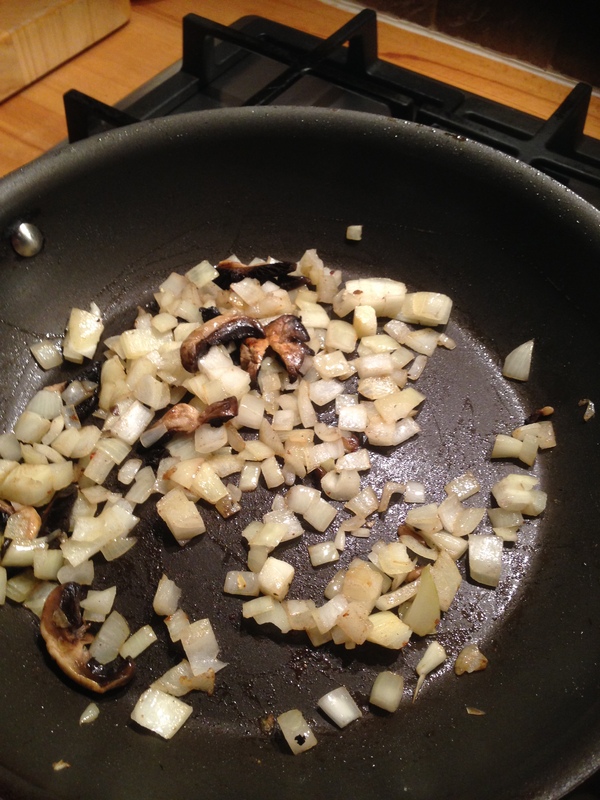 I did really like this and don’t think I missed the garlic, and am also glad I didn’t deep fry them! Would I make this again? Yes!! I had a chicken and I had half a pot of cream so this was tea tonight.. 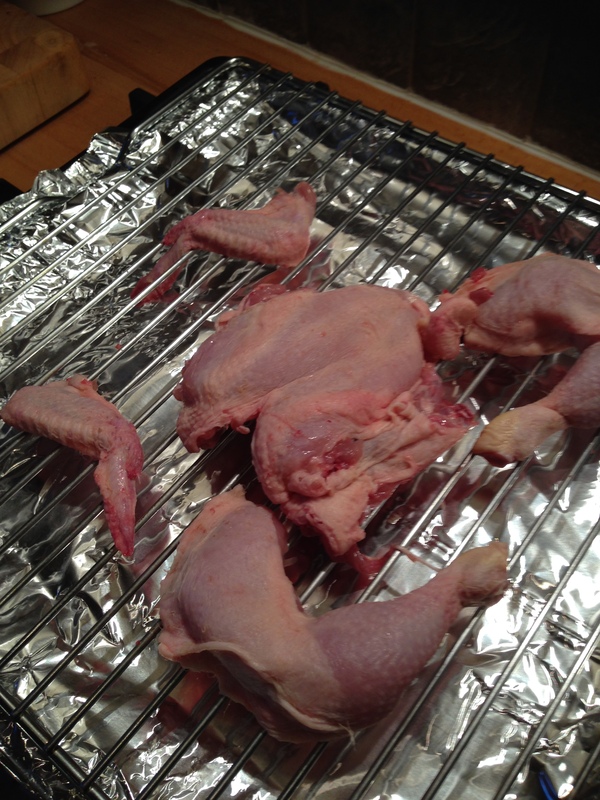 The recipe says chicken joints and I had a whole chicken, so I attempted to joint it! 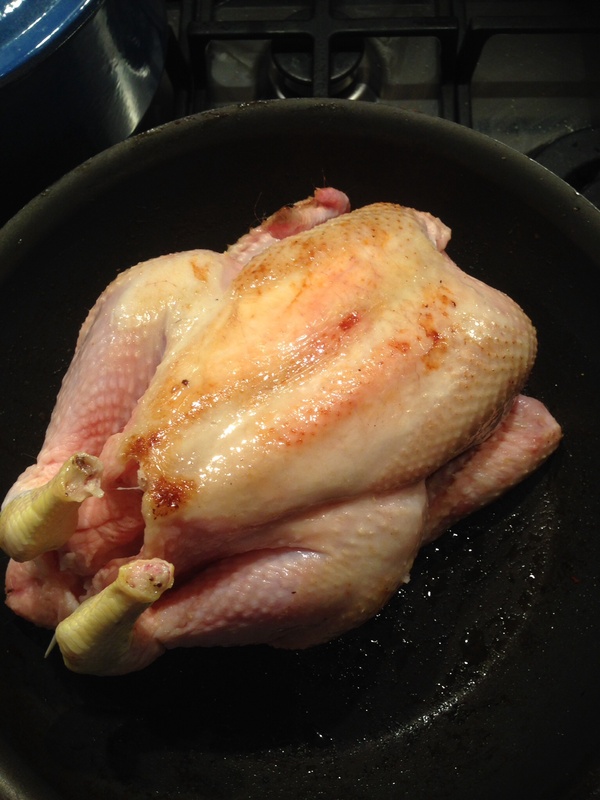 I ended up with two legs and two breasts.. This is possibly going to sound daft but I couldn’t figure out how to get the thighs!! After cutting off the legs I really couldn’t see an obvious thigh, the only thing I could think was that I’d joined them together! Well I didn’t want to waste any meat on the chicken so I put the rest of the carcass in a pot with herbs, peppercorns and an onion and left to simmer to make a stock and then I could scrape any more meat from the bones. 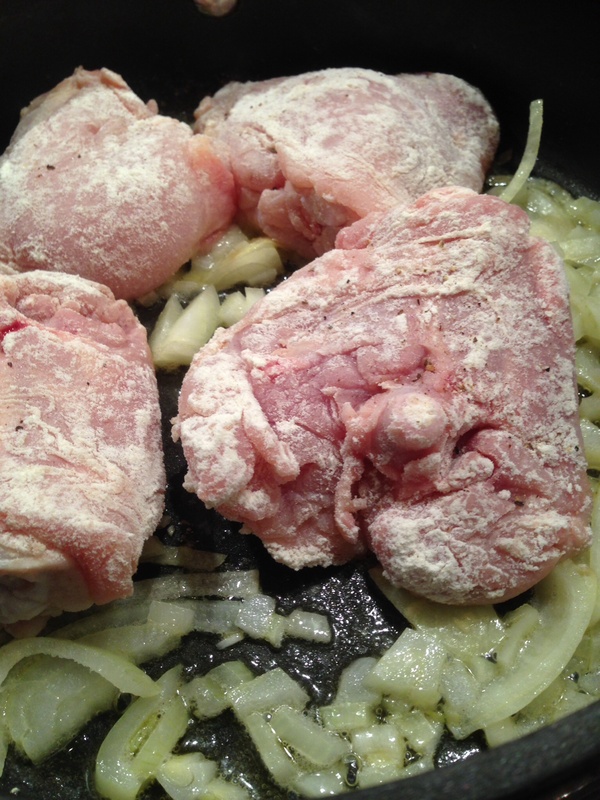 The chicken and onions are put on to fry.. It took way longer than 5 minutes for the chicken to turn golden brown, more like 15 minutes..
Once the chicken was nicely golden I seasoned it, put a lid on and left to simmer for the 20 minuets. 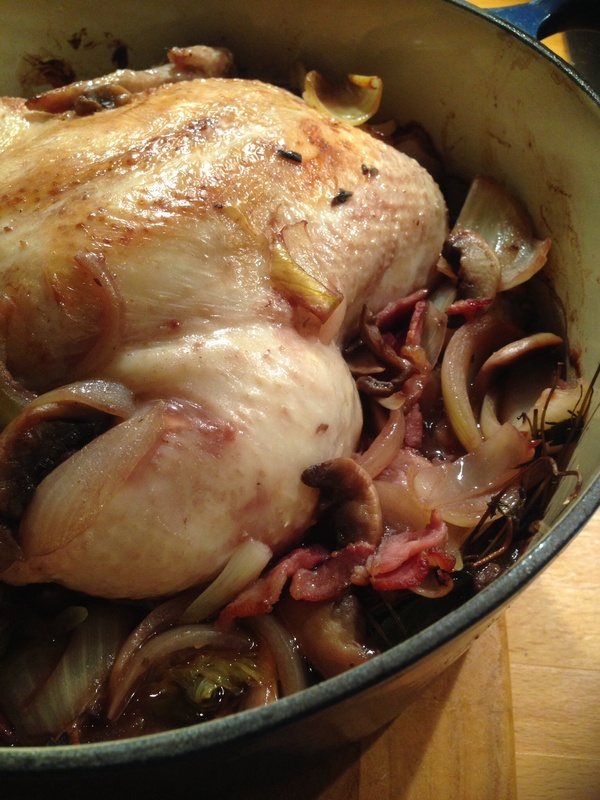 After then the chicken was looking well cooked and the onions were looking wonderfully soft..
Once the chicken and onions had been removed I added the flour, wine and stock.. I didn’t have the usual bouquet garni components so I just had to wrap some thyme leaves from my garden round a bay leaf! 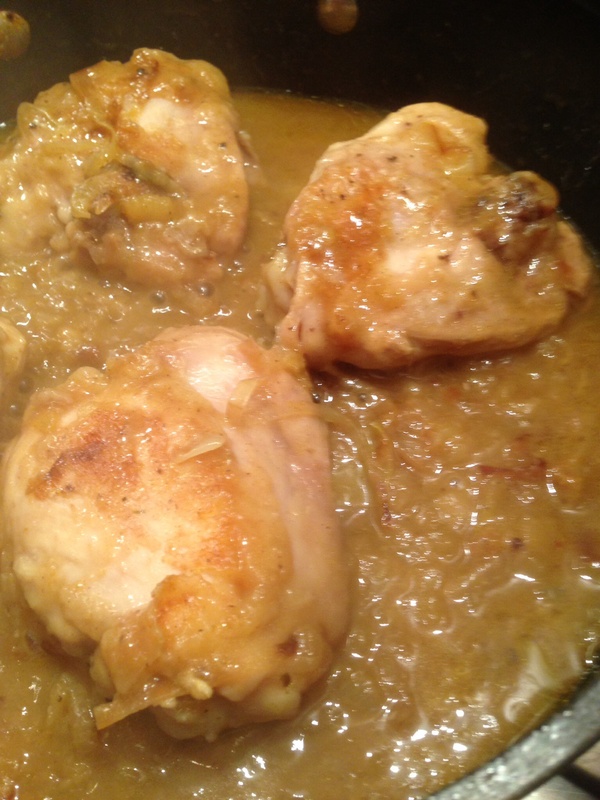 That went into the sauce followed by the chicken and onions..
After about 15 minutes I removed the chicken to a warmed casserole dish..
Then I added the cream to the sauce..
….heated it up and then poured over the chicken..
May not look too great just now but it smells fantastic! All I served this with was some carrots and peas..
Well this one possibly my favourite chicken dish so far! 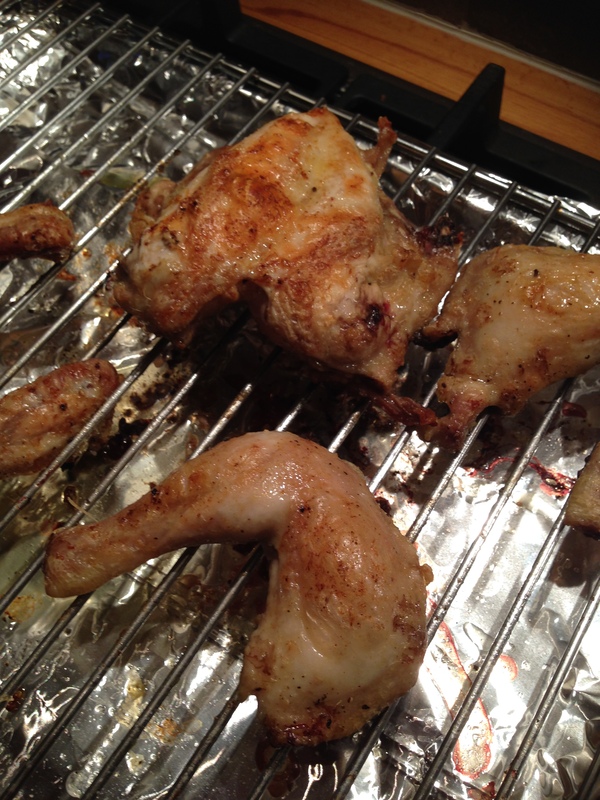 The chicken is really nicely cooked, but it’s the sauce that is really fantastic! It’s thick and creamy and just lovely. 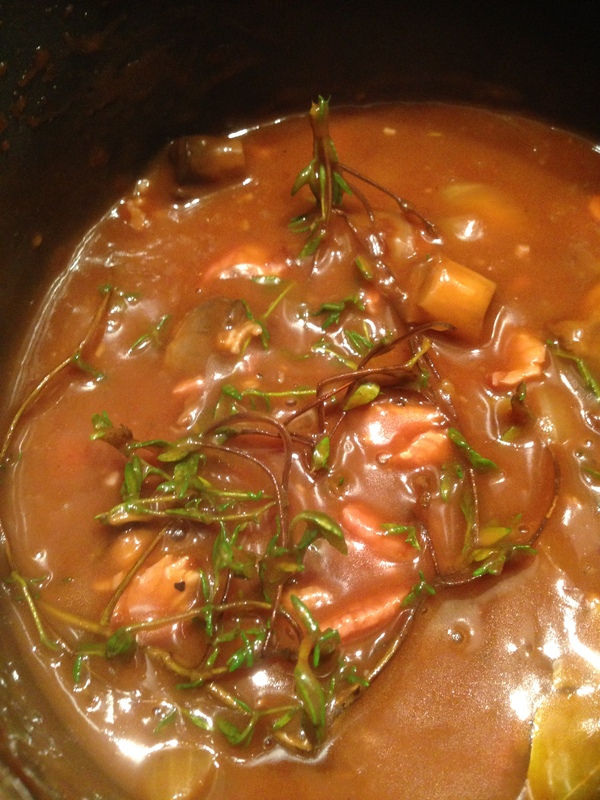 The chicken and sauce is such a great combination, which is maybe to do with all that thyme, but I do think as long as you add some sort of herb it will be good. 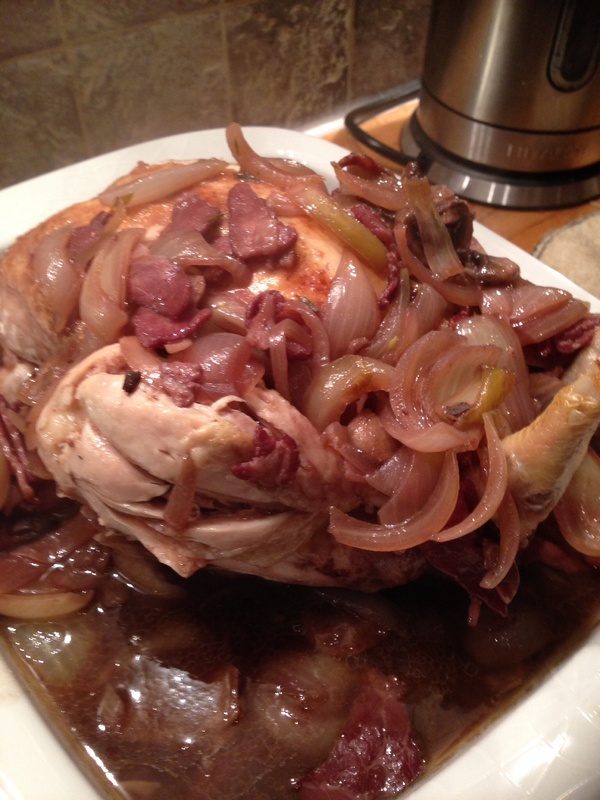 We all loved this, my daughter said it was the best chicken dinner ever! Would I make this again? Oh yeah! 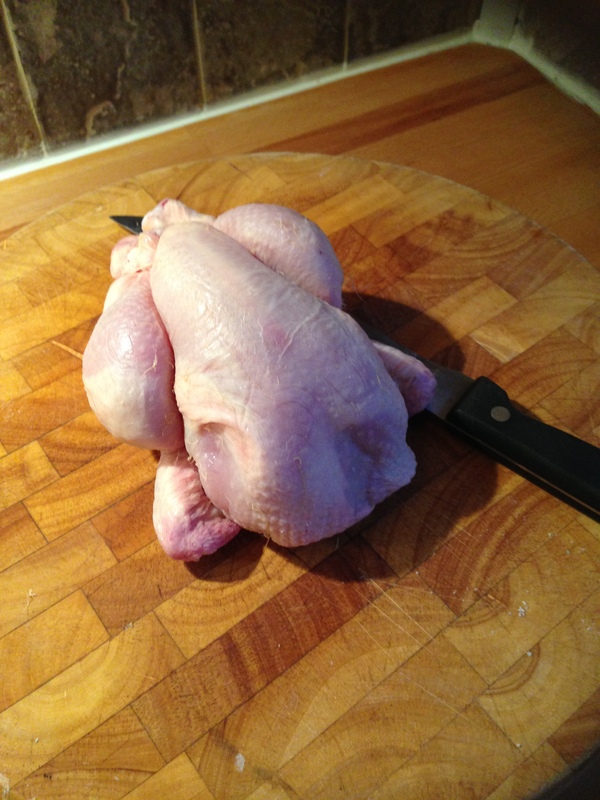 This is another cut of meat that I’ve never cooked before, I cook chicken a lot but never a little poussin, which is pretty much a small chicken! Apparently it’s a butchers term for a young chicken, less than 28 days old.. So the recipe does say 4 Poussins which I’m assuming is meant to serve 4 but I’d only bought 1!! I decided I’d just try cooking 1 and see how I get on so that if I like it I can make again and serve one per person. It is pretty small..
It’s pretty easy to cut and open out..
Next I mixed up the other ingredients..
…and that was spread over the wee bird, I didn’t use all the mixture as I kept some back to cover over the underside when I’d turned it. After just over 20 minutes and a couple of turns it was looking cooked and smelling good too!! So I know this looks like hardly anything and was for the three of us to try but we did have with some salad and veg! So I was worried this wasn’t enough to time to cook it but it was cooked perfectly, the meat was nice and juicy and flavour was great. I do sometimes wonder why I bother coating things like chicken as I never eat the skin but you could taste the flavours from the sauce mix, had just a slight tang. Overall this was good and we all enjoyed it! I can see how you could a whole one, pretty sure even my daughter could’ve managed a whole one herself!! Would I make this again? 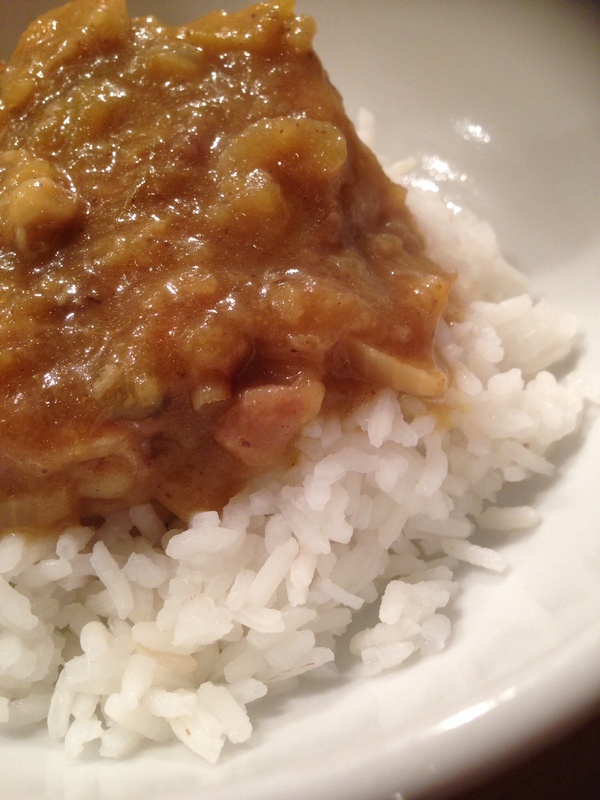 Yup..
I’m getting used to sweeter curried recipes after all the earlier ones I’ve tried from this book! This one didn’t have any sultanas in it like I thought it would! I decided to use just chicken thighs for this; they’re cheaper and I think are better in dishes like this..
It’s all very straightforward to prepare, just a bit of chopping and frying! It doesn’t seem like much stock though, by the time I had halved the quantity in the recipe I only have about 70ml.. I kept checking it throughout the 40 minutes and it did thicken but didn’t dry out, so was looking ok! 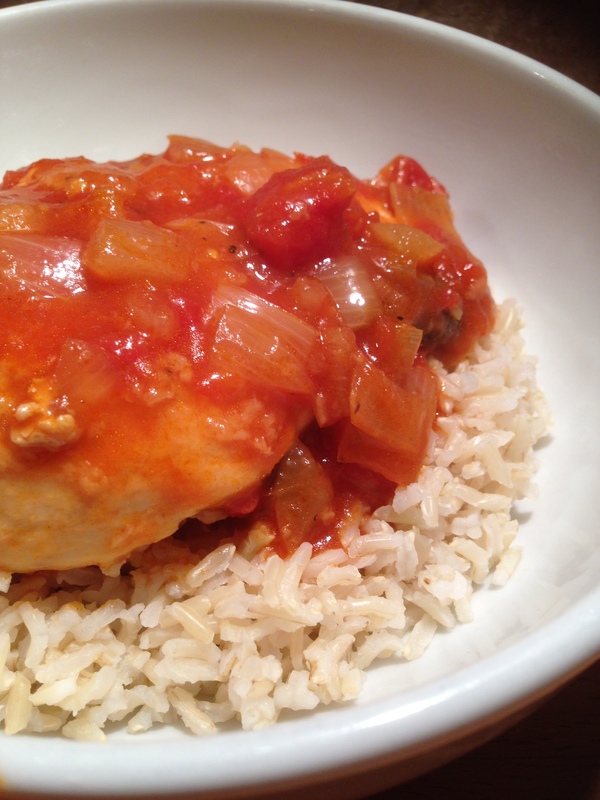 I just served the chicken thighs on some plain boiled rice and more sauce poured over the top..
Well the sauce is great! 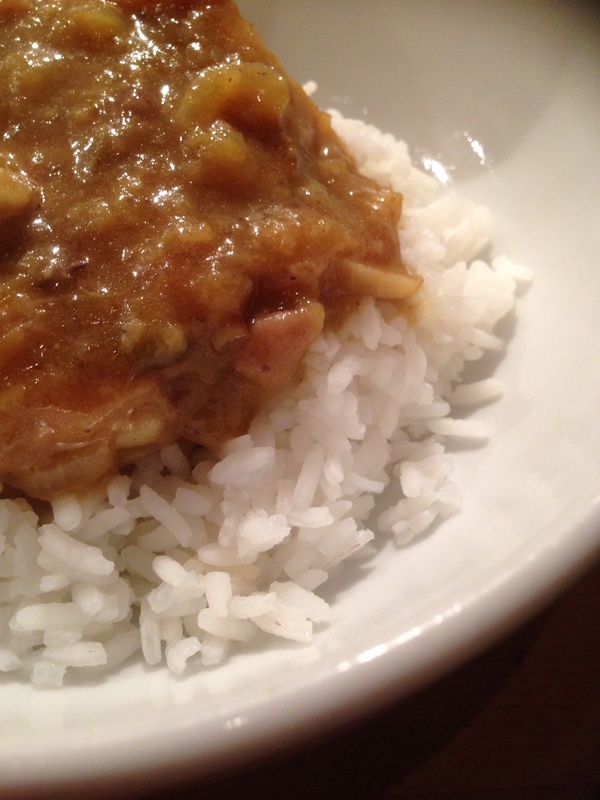 It does not look great but the flavour is lovely, very similar to all the other curry recipes! It’s sweet but in a nice comforting way! 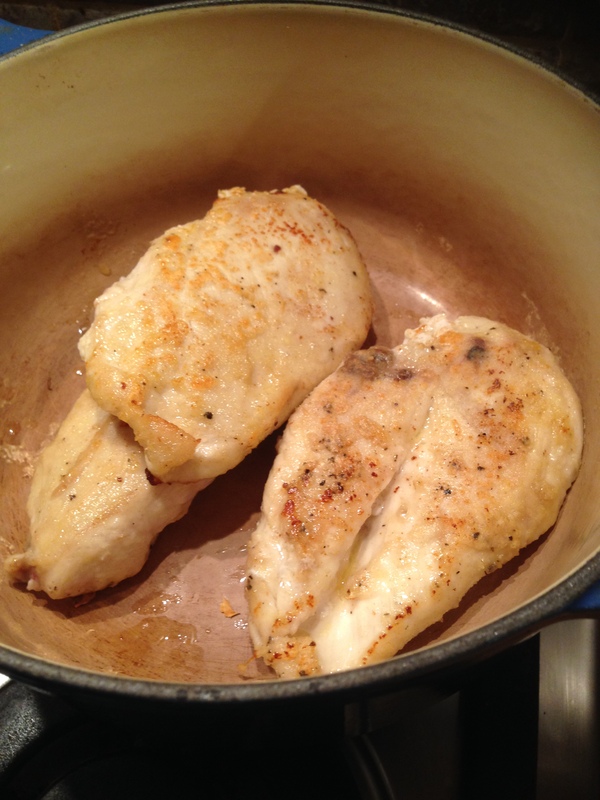 The chicken is lovely and soft and overall a good dinner. My daughter said she didn’t just like this, she loved it!! I have actually made this a couple of times before but never quite like this.. The other times I’ve made this it has been with joints of chicken rather than a whole one, never really a fan of cooking a whole chicken in liquid like this. 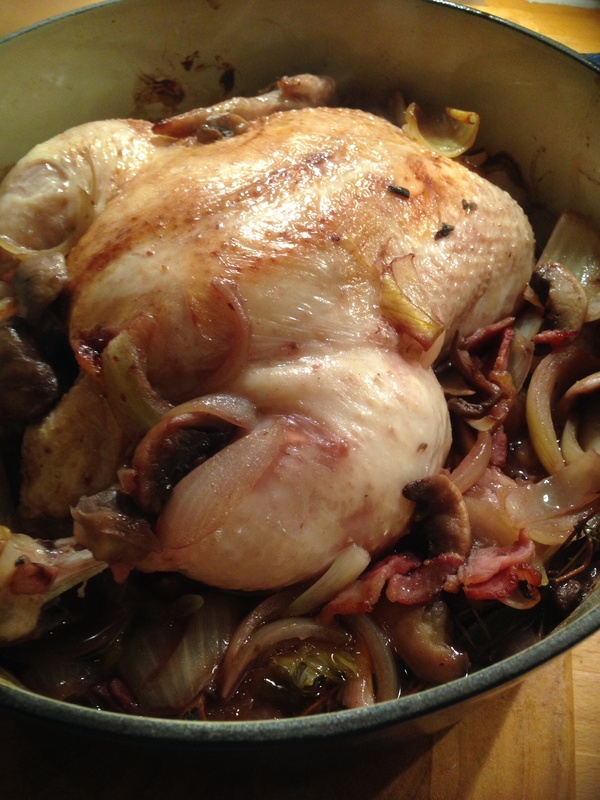 Anyway I started with cooking the bacon, mushrooms and onions..
Then I fried the whole chicken in a frying pan..
After about 10 minutes I poured over the brandy, and then lit that with match. What a flame!! I was actually really surprised how big it was, and just glad nothing went on fire! You can’t really see the flame in this photo but it was quite impressive! 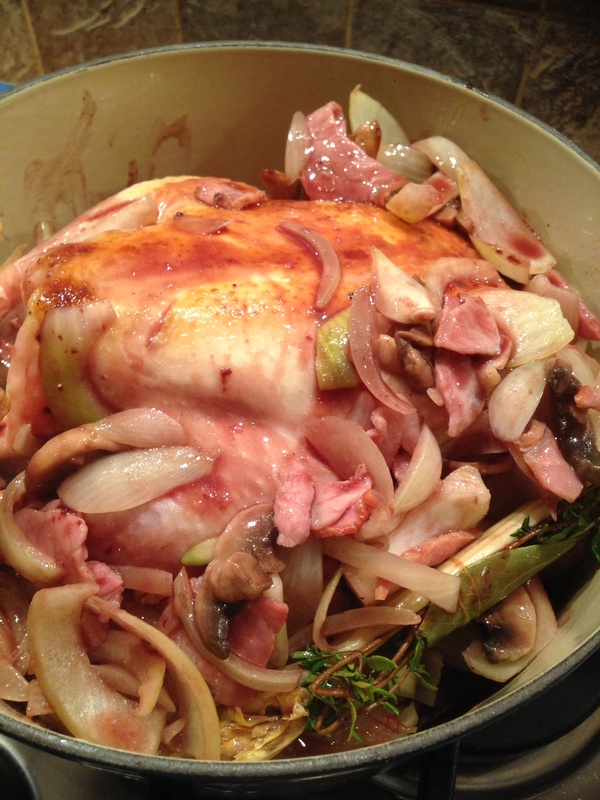 Fortunately I do have quite a big casserole dish to fit the whole chicken..
Next I made the sauce with the wine and stock, then added the bouquet garni and bacon mix. I poured all this over the chicken, put the lid on and into the oven for an hour. 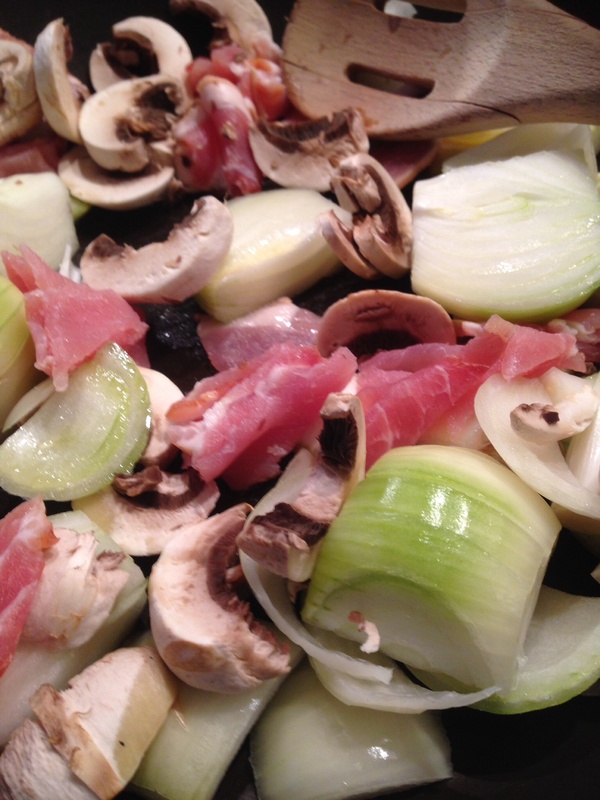 I lifted out the chicken and transferred to a serving dish, then I fished out all the bacon, mushrooms and onions. The sauce that was left in the casserole dish did smell good and did taste good but all just looked really greasy, so I was reluctant to use too much of it. We were having this with some smoked garlic mash.. 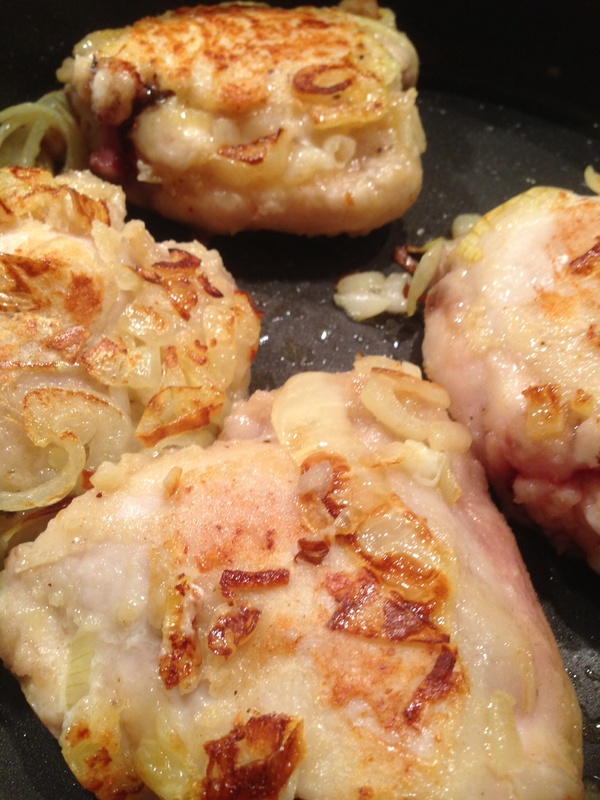 The chicken is really good, it’s lovely and soft and tastes great. 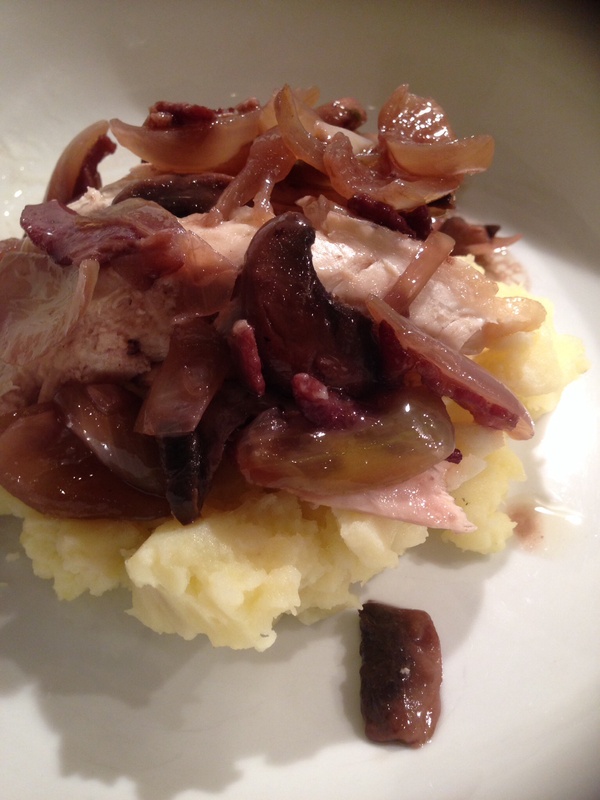 The mushroomy mix is also fab and the flavour from the winey sauce is great. The sauce itself does taste good but it’s just a bit too greasy for me which is a shame as I think the sauce is a pretty crucial part of this dish!! It was a great dinner though and we all enjoyed it! Would I make this again? Maybe, I don’t know if I’d make it with a whole chicken..